Time to take Fido for a walk, you grab the leash and your pup dances around excitedly as you snap it on. Off you both go for some fresh air and exercise. But wait … is there a dog-walking etiquette you should be aware of? Yes. Yes there is. In fact, there’s nothing worse if you’re a non-dog owner than people who walk their dogs without manners or caring for others and their property. Walk your dog, but do it with manners. First is the obvious – cleaning up after Fido if he decides to poop anywhere but his own yard. No one wants to step in it, no one wants to see it, it’s not sanitary, it can spread disease and it’s just plain gross. Buy some sort of clean up bags and plan on taking care of any mess Fido deposits during the walk. Many come with a small container that attaches easily to your leash, and is always handy. So don’t pretend you didn’t see your dog go, clean it up! Now that you’ve cleaned up the mess, do not … I repeat do not put it anywhere but in your own trash container. Be responsible, clean it up, and take it home to dispose of. That takes care of the messes that you can physically clean up, but what about urination? Sure, it evaporates and the “evidence” is gone, but it’s tough on grass, and again, it’s gross if the item that got wet is something people have to handle (like their trash can). Be a good neighbor and keep your dog off of private property. This policy eliminates any worry about upset neighbors. There are two primary types of leashes. Retractable and fixed-length. When walking in a neighborhood, you should use a fixed-length leash. It provides better control of your dog, and in neighborhoods you are more likely to encounter others walking their dogs, kids on bikes, scooters, skateboards and parents with very young children. With a fixed-length leash, you have complete control, and can move you and your dog not only out of harm’s way but out of the way of others. That is not to say there aren’t places where a retractable leash is preferred – when on open land they give your dog some freedom to roam and sniff to his heart’s content. 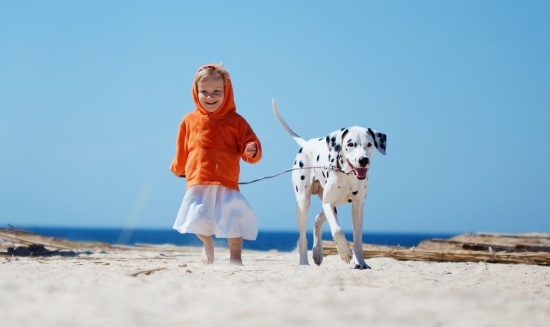 If you do use a retractable leash, keep in mind that some can be dangerous. If it has a thin wire cord, instead of a cord more like a tape, it can wrap around legs and cut deeply. Please, dispose of any cord types! Remember that not everyone is a pet-lover and act accordingly. While in close proximity to people, keep your leash short and your dog under control. Not everyone wants a wet nose pressed against them during an enthusiastic hello. If someone wants to pet your dog, they will ask! Same goes for bikes, skateboards and runners. The fast movements can excite any dog and elicit a chase response. Again, keep ’em close and avoid accidents, or worse – a bite. An excited dog is not thinking clearly. If you choose to walk your dog during the day, please remember that sidewalks and roads are HOT during summer months! If you can’t walk on the concrete or blacktop without burning your feet, neither can your dog. Many dogs have come back from walks with blistered paw pads that need medical attention. Stay off the pavement during hot summer days. If you’re walking trails and hot pavement isn’t an issue, do remember that hydration is vitally important. Carry a water bottle and portable dog bowl so you can offer Fido a drink. Dogs suffer from heat exhaustion and heat stroke the same as we do – and they are wearing fur coats, so be considerate and offer water frequently. Many folks walk their dogs in the evening, after work and dinner. It can get dark, especially in the winter months, so steps should be taken to ensure safety. Get reflective gear for both you and your dog. There are collars, harnesses and leashes that are reflective, and these should be used when walking in the evening. Wear light-colored clothing, and have a flashlight, make yourself be seen so you stay safe. Walking your dog is fun and good exercise for both of you. It helps Fido expend some energy, keep fit and is a great relief from boredom. Your dog will be healthier and happier for it. Your bond will grow deeper with each walk you take together. Just remember to be a good neighbor, and be a shining example of proper dog-walking etiquette. Your neighbors will thank you for it. Next ArticleTwitter: The Breaking News Source?